BREWSTER, Mass. 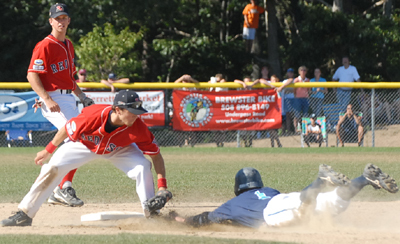 – The Eastern Division Playoffs continued on Wednesday afternoon at Stony Brook School in Brewster, where the Whitecaps held the 1-0 lead in the series against the Y-D Red Sox on their home turf. 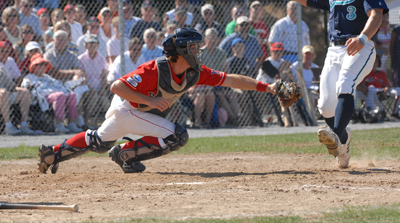 Game Two lacked the excitement of Tuesday’s action-packed 13 innings; however, for Sox fans, nine innings were just fine as Y-D topped Brewster 3-1. 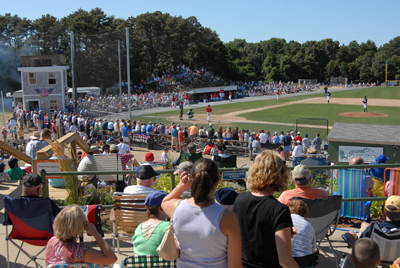 The biggest crowd of the season at Brewster. With the Sox up 2-1 in the top of the fourth, Stanford's Michael Taylor homered to left field to put an exclamation point on the win for Y-D. Taylor's home run was his fifth of the year (counting regular season play). He went 2-for-3 with a double in Game Two. Taylor's homer in the fourth and a Steve Strausbaugh (Western Carolina) triple early in the game along with strong defense and pitching led to today's win. Y-D head coach Scott Pickler praised his team's performance. "We went 13 innings yesterday and we were lucky that [Nate Boman] pitched a strong six innings for us today,” he said. “Going into today's game, the players knew what they had to do. They played hard all year and weren't ready to go home. But ultimately I feel that they rallied around Boman's pitching and Strausbaugh's triple." Out at home, with the tag from Danny Lehmann. Taylor has been a consistent player for the Sox this season, and today's game-winning homer comes as no surprise to Y-D fans. Entering the playoffs, Taylor notes that his mindset has changed a bit from regular season play. "Going into the playoffs it’s a completely new ballgame, it’s a new season,” Taylor said. “We come in facing pitchers at the top of their games. It really comes down to focusing on what we're good at. We've played these teams a couple of times in the past and now we need to capitalize on their weaknesses to be as successful as we possibly can." As far as his goals for this season, he hoped primarily to focus on improving his personal game, while stepping up to bat (literally) for his team when they needed him most, and thus far he has. Taylor feels that his season with the CCBL has prepared him for play next spring at Stanford: "I've learned quite a bit from teammates and my competition as well. They have forced me to adapt to a new level of play and understand my strengths and weaknesses as well. I believe that as a result of my time here, I will return to Stanford as a better player." Alden Carrithers applies the tag. Taylor's Stanford teammate Nolan Gallagher pitched in relief today. Gallagher has been a jack of all trades this season for Y-D, coming in as a starter and finishing the year from the bullpen. Taylor holds his teammate in high regard, saying, "Nolan is a great ballplayer. He is a hard worker with great focus and I am fortunate to have played with him for two years." Gallagher says the same of Taylor, crediting him with helping him become more social while off the field, and pushing him to work harder while being his support system during games. Y-D and Brewster will both continue their quests for the championship in the deciding game of the series on Thursday at Red Wilson Field at 3 p.m.